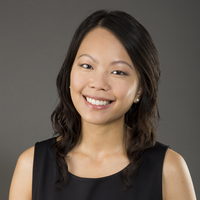 / Our Team / Jane Mok, O.D. Dr. Jane Mok hails from the vibrant city of Toronto, Canada. After several years of providing comprehensive eye care in her hometown, she relocated to Baltimore in 2014. Dr. Mok is most known for her gentle and caring attitude towards her patients, always taking the time to understand the visual and medical needs of her patient as a whole. Armed with a commitment to provide exceptional eye care both locally and globally, Dr. Mok has led teams to both Kenya and China to provide eye examinations and eye care seminars to those in need. She graduated on the Dean's Honors List from the University of Waterloo with a Doctor of Optometry and a Bachelor of Science - majoring in Honors Science and minoring in Biology. While completing an externship focusing on ocular disease at Omni Eye Specialists in Baltimore, she worked alongside cataract, corneal and retinal specialists. Dr. Mok has a special interest in vision development and Behavioral Optometry. She believes everyone deserves to have a comfortable and efficient visual system. She offers various treatment options, including Vision Therapy, for patients who may require refinement of their visual skills for an improved quality of life. Dr. Mok is an InfantSee Program Provider, a member of the American Optometric Association, Maryland Optometric Association and a Clinical Associate of the Optometric Extension Program Foundation. In addition to English, she is able to provide eye examinations in Cantonese and Mandarin. In her free time, Dr. Mok actively serves with her church community and enjoys quality time spent with her husband and family.